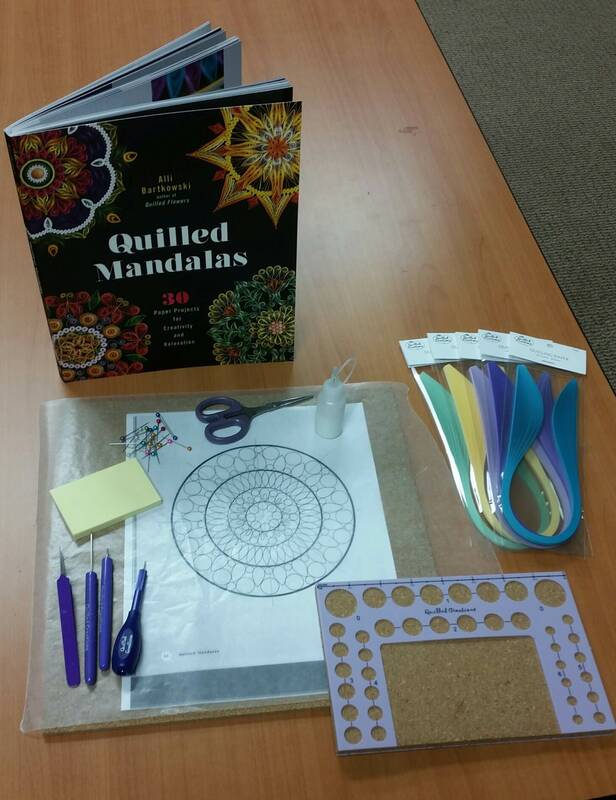 I'm so excited to start quilling my first mandala! The hardest part so far was deciding which one to do first. Here it goes. Please feel free to ask me any questions or give any feedback. 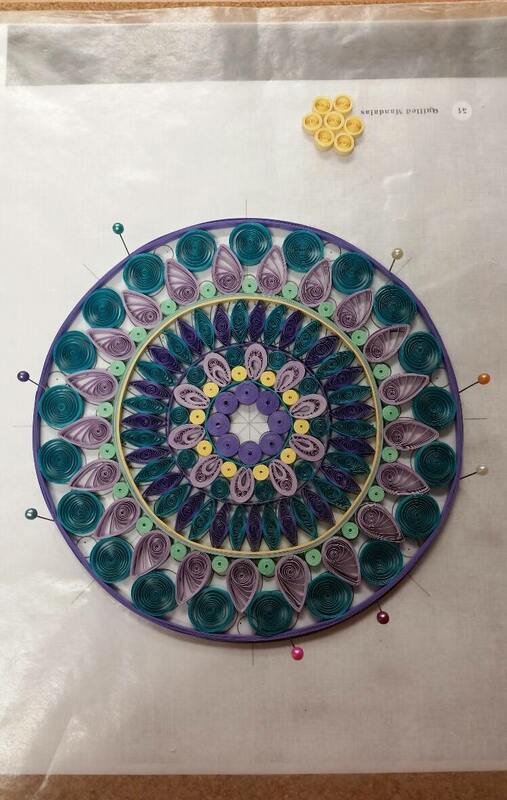 I put a dab of glue on the purple tight circle and started to wrap the teal paper around all of the tight coils. I put another dab of glue on on the end of the teal paper and glued it. I used the tweezers to hold in place a few seconds so it would stick. Now onto the next row!! I like to layout all the pieces to make sure they fit before I glue them all down. I use the pins to hold the pieces in place. 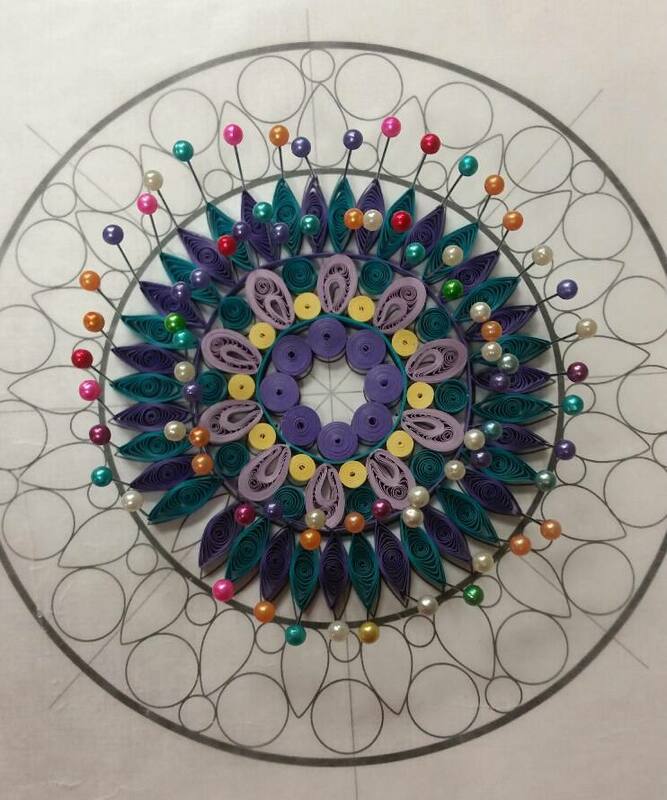 I added the lilac crescents and pale yellow tight circles then decided to put the border around before adding the teal circles. This a picture after I added the teal coils. I LOVE what you are doing so far! I do have a question though: How did you add photos to your post? I wanted to make a post to share a few projects that I custom did for various people. It asks for a picture URL or something but I'm not sure where to get that since the photos are simply saved on my computer. Unfortunately it isn't a real simple process yet, we are hoping to make it easier and we are working on that. But, for now you will need to upload it to some photo sharing site, like http://www.photobucket.com. Once you have an account there, you can upload your photo and it will give you a link that you can copy here to show the photo on the forum. If you need any assistance walking through that, don't hesitate to contact me. Jennifer thank you so much!! 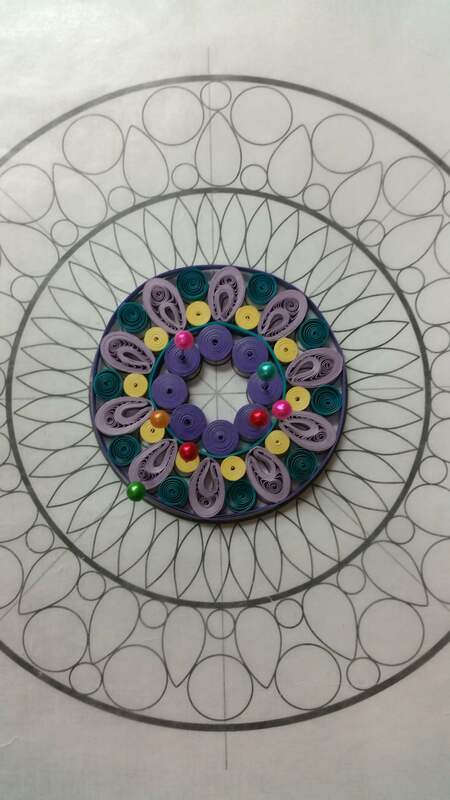 I am finding quilling mandalas quite addictive. Luckily I laid out all the pieces first to make sure it fit before I glued. I put them exactly how it was shown on the drawn diagram. It called for 39 marquises. But if 39 are used you end up with either 2 teal or 2 purple next to each other. The blank spot is where the 39th marquise should go. My solution was to take out the pin from the top of each marquise which would cause it to move over slightly so 38 would fit perfectly and that is exactly what happened!! Now I am able to glue all the marquises. I used the end to end technique to make one long continuous string of paper. 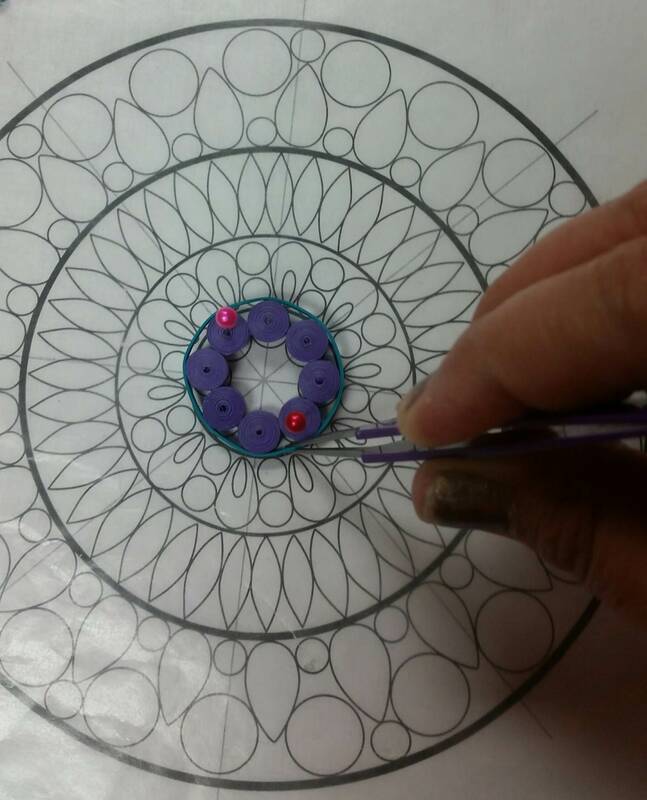 I started to glue it to one of the marquises and then wrapped the paper around the whole mandala several times. I pulled it tight every few wraps. I didn't want to pull it to tight to put to much tension on marquises but I didn't want space in the wrap. 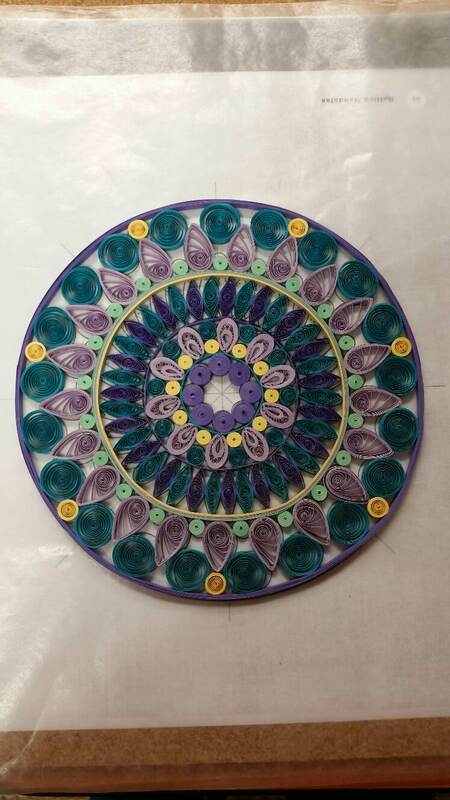 I laid all the lilac teardrops and mint green tight circles where I wanted them to go and then I went back and glued them all to the paper that I wrapped around. This is really beautiful. Your doing such a nice job. 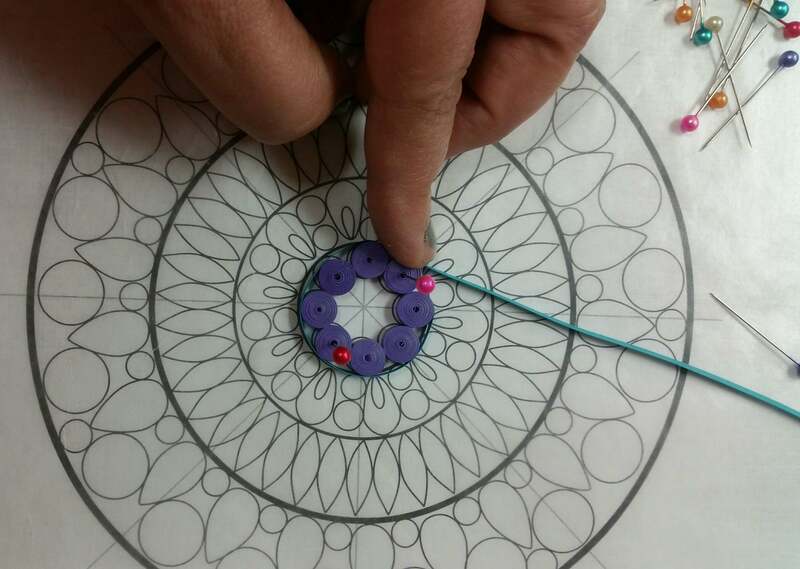 I just might have to try a quilled mandala. I think it would make a great gift framed. This is coming along beautifully! 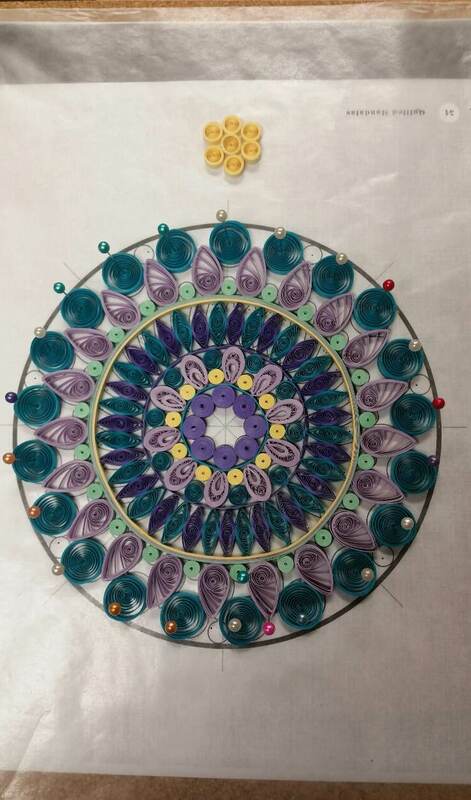 Keep up the great quilling! Thank you Dorothea. 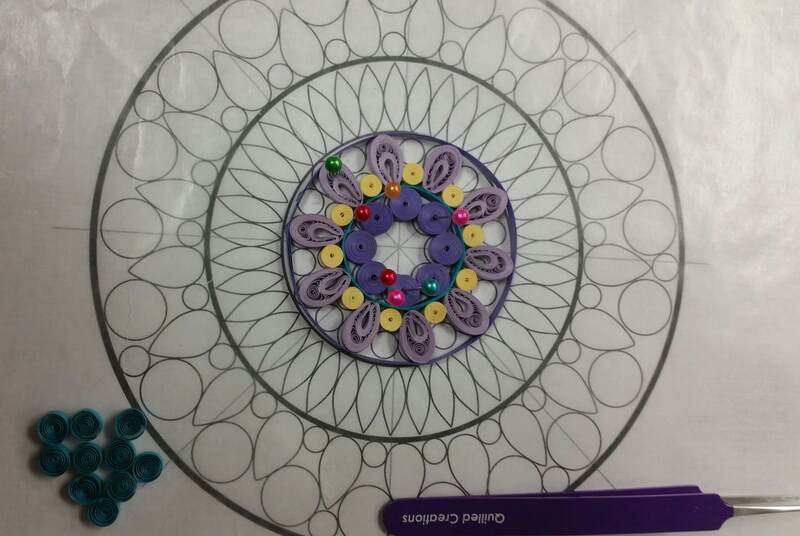 Most of what I have quilled in the past has been smaller projects and I was a little worried about starting such a big project but have found it to be much easier than expected. 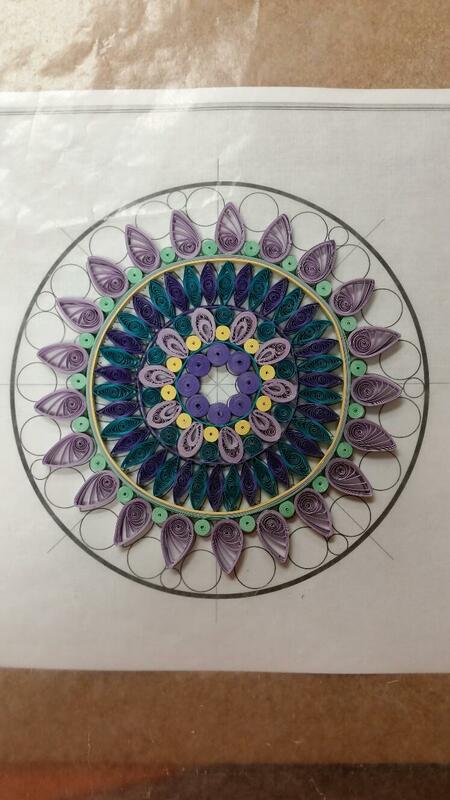 I just love Alli's book Quilled Mandalas! I have already decided I am going to start another when as soon as I'm done with this one. I put the teal coils where I wanted them to go and used pins to make sure they did not move. After I took the picture I glued them all in place. Now to wrap the outside ring around. I also already quilled the last yellow coils and just have them sitting there waiting to be glued. 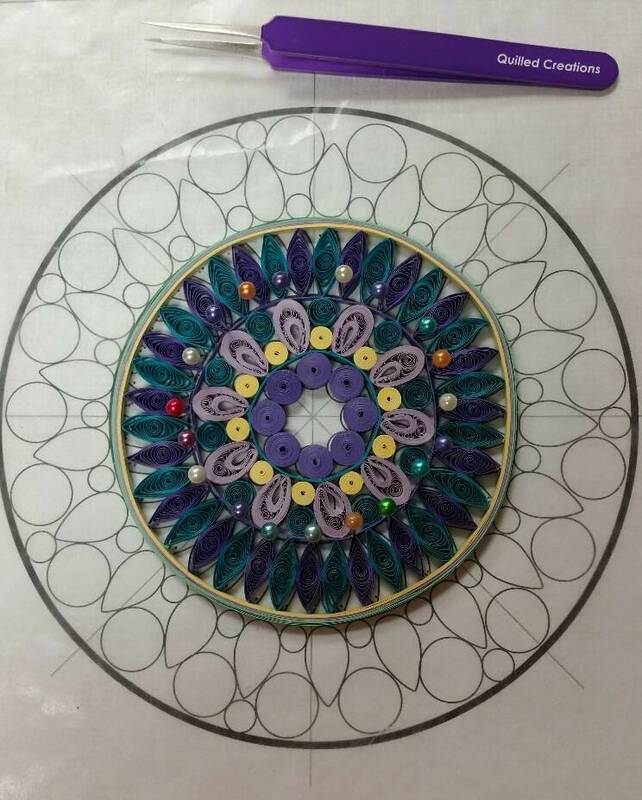 Wrapped the very long purple strip around the entire mandala. I added the last piece the yellow coils! I will let it dry completely before I try taking it off the wax paper. 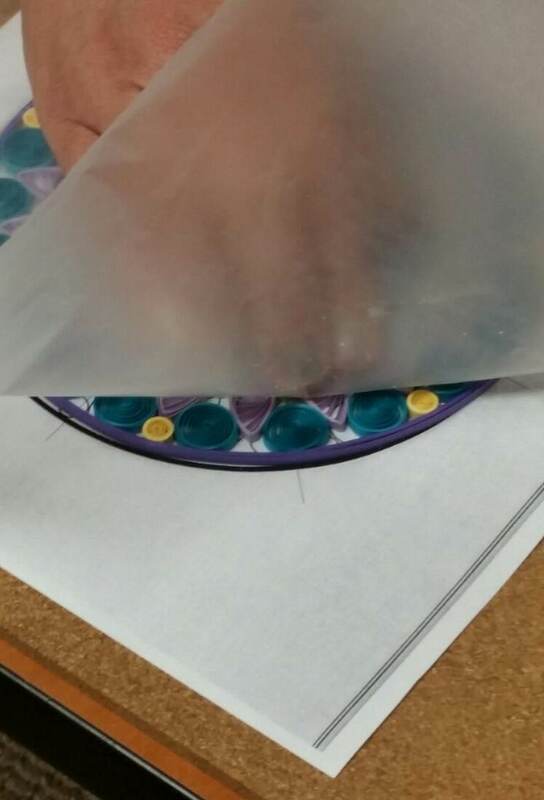 When I went to take the mandala off the wax paper I realized it might get ruined if I just start pulling it up. 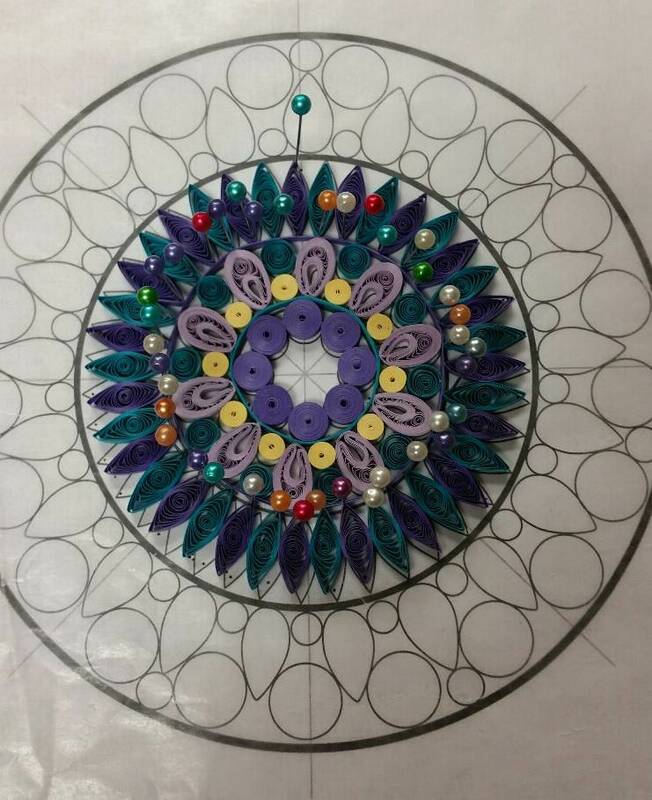 What I decided to do was take the whole think and flip it upside down so the mandala was on the bottom and wax paper on top and I just started to slowly peel away.